Boone Central Color Day Royalty. Boone Central High School honored Color Day Royalty last Saturday, Oct. 15, during ceremonies in the school gym. 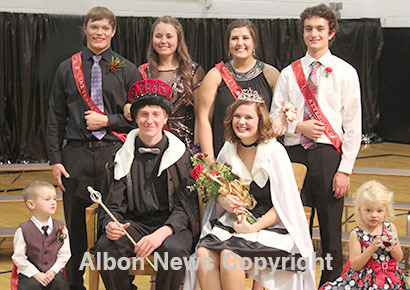 King and queen (seated) were Derek Stuhr, son of Rod and Kim Stuhr, and Sierra Travis, daughter of Dr. Joel and Anastasia Travis and Allison Pritchard. Second attendants (back, l.-r.) were Dalton Wagner, son of Kevin and Lisa Wagner, and Riley Boyd, daughter of Mitch and Jessica Boyd, and first attendants were Karley Zoucha, daughter of Dan and Angie Zoucha, and Thomas Hosford, son of Paul and Lori Hosford. Pages (flanking the king and queen) were Gabe Grape, son of Jeff and Sarah Grape, and Emily Levander, daughter of Tony and Nicole Levander. 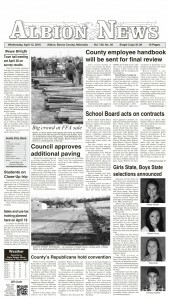 The ceremonies saluted all Boone Central seniors and all extra-curricular activities.